Sumptuous. With a very accurate editorial format and beautiful images, which perfectly render the value of the portrayed pieces. But, at the same time, it is also a work with a significant scientific content. Equus frenatus, the book that finally shows the Giannelli Collection, is not only a beautiful package, designed to show off what is certainly one of the most important private collections of ancient bits in the world, but it is also a unique research tool for anyone interested in the history of equestrian culture. 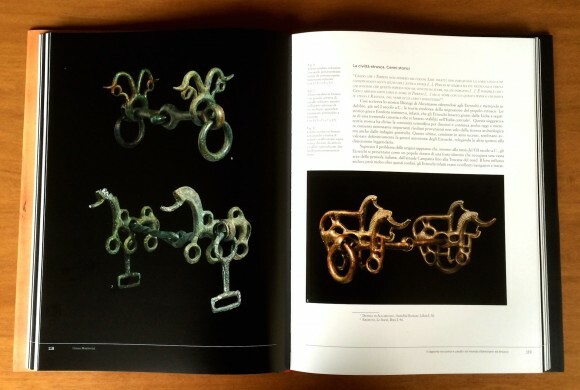 In fact, the essays in the book not only describe the most valuable pieces of the collection, but they also present the state of the art knowledge about the evolution and use of the bit through the centuries. I have already told you, in a previous post to this blog, of the splendor of the Giannelli Collection of ancient bits on the occasion of the beautiful exhibition that was held last summer in Travagliato (you can read the article by clicking on this link: The Giannelli Collection of ancient bits on display in Travagliato). It is an exceptional collection, gathered over decades of research. It ranges from the first bone cheek pieces from Central Asia, dating back to the second millennium BC, progressing up to refined chiseled bits of the eighteenth and nineteenth centuries. The collection has accumulated more than 500 pieces, most of them very valuable. In the introductory essay, Claudio Giannelli presents all of his expertise on this complex subject. He summarizes, in an extremely clear and accurate way, four millennia of the history of bits, following the chronological development and contextualizing the different types of bits of each period and to the civilization from where they came. The result is a charming and very interesting overview. Giannelli’s historical documentation also underlines, that the parable began with the first bronze snaffles, used two thousand years before Christ by the nomadic peoples of Central Asia, moving on to the artistic bits from Luristan, to those from ancient Greece and the Roman period, and on to the very severe medieval and Renaissance bits, ending with the return, at the beginning of the twentieth century, to the simpler mouthpieces, advocated by Federico Caprilli and by his “natural system of horsemanship.” “Therefore, – Giannelli writes – we notice a return to basics with an increasing use of the normal articulated snaffle, certainly the lighter mouthpiece and the most respectful of the horse’s delicate mouth, provided that it is always combined with patience, progressive work and, above all, love for the horse” (p. 40). The most special areas of the Gianelli Collection are two. 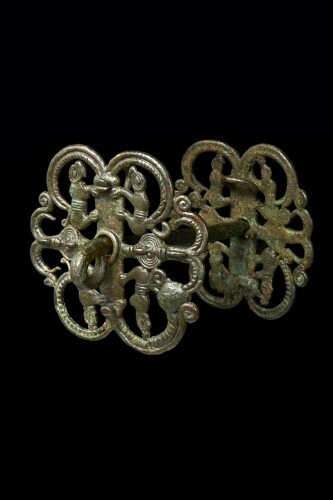 First and foremost, the magnificent bits from Luristan, true masterpieces in bronze, made with the technique of lost wax casting, by a civilization that flourished between the second and first millennia BC in the southwestern region of what is currently Iran. The Giannelli Collection is probably the largest and most important collection of these very special artifacts in the world. Equally unique is the collection of Villanovan and Etruscan bits. Even in pre-Roman Italy (IX-VIII century BC. 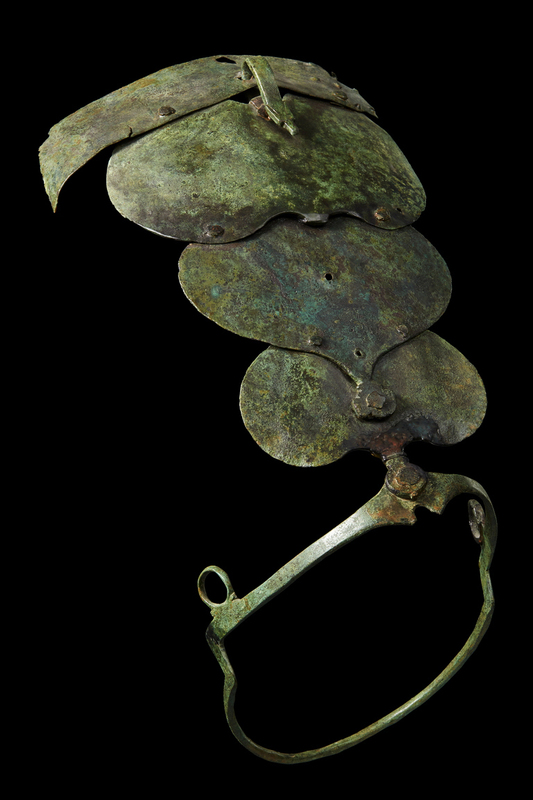 ), the practice of burying the dead with grave goods, that frequently included horse bits, was widespread. The bits were mostly snaffles, with cheek pieces representing stylized horses, that today look curiously modern. These two areas of the collection are described in the essays by Manuel Castelluccia, archaeologist specialist of the Ancient Near East, Caucasus and Iran, and by Chiara Martinozzi, archaeologist, specialist of the Etruscan civilization. Both provide a rich historical and cultural framework in which they place the production of these bits and the description of their various types. With regard to the study of the evolution of bits, the Middle Ages are definitely a difficult period. The artifacts from this period are few, as are the written sources, while the iconographic sources are difficult to interpret. The philologist and historian, Patrizia Arquint, describes this period with his usual accuracy and clarity, offering a survey in which, despite the caution due to the relative scarcity of data, the historical outline is complemented by the technical description. The Renaissance is, in contrast, the era in which more importance is given to the bit and the “art of bridling”, i.e. the art of choosing the most suitable mouthpiece for each horse was considered a key to showing the competence of the true rider. This is clearly testified by the equestrian treatises that began to be published since the mid-sixteenth century. 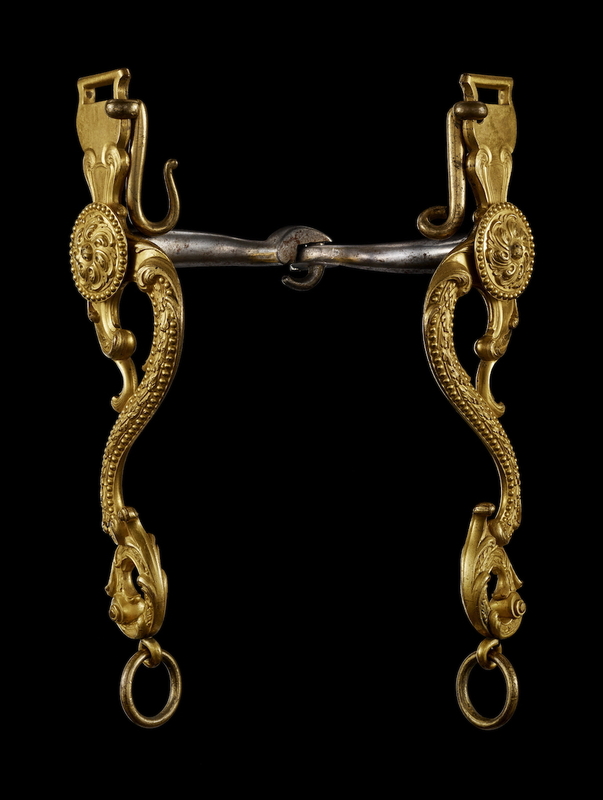 Most of these works include a series of drawings of bridles, whose bewildering variety was designed precisely to suit the different types of horse, under the illusion of correcting any possible defect with the use of specific instruments. In fact, given the severity of their action, it is probable that those bits produced quite the opposite effect. Nevertheless, from the manufacturing point of view, they are real works of art. 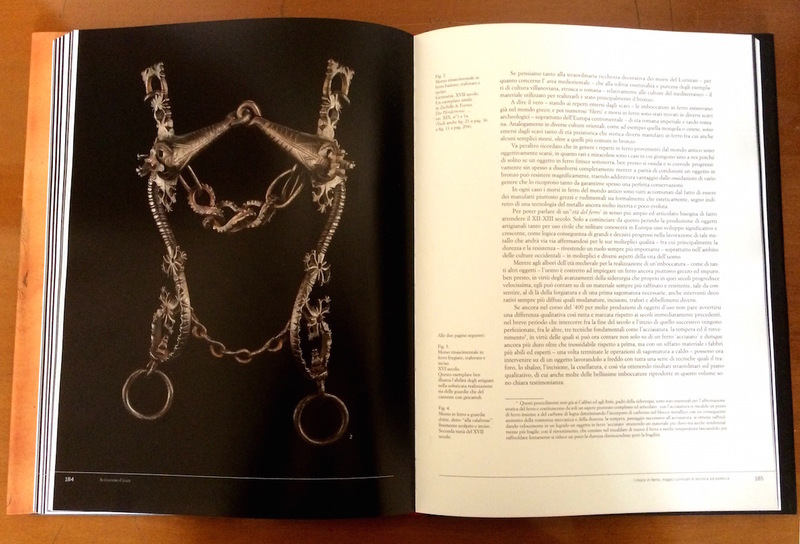 The flourishing of the new literary genre of the equestrian treatise is evoked in an essay by Mario Gennero, curiously focused on Claudio Corte’s Il cavallerizzo (The Horseman), which is one of the most interesting books about horsemanship of the sixteenth century, but is also one of the works which devotes less space to the art of bridling, while other authors of the time write at length about this subject. It is certain that the technical capacity of the Renaissance “bit makers” was amazing. By virtue of the strong progress of iron metallurgy, the craftsmen of the time, as Alessandro Cesati wrote in his essay, were able to make, with simple tools, such as files, hand drills and chisels, “artifacts that looks like small iron sculptures: art objects which sometimes are so refined that they make one almost completely forget their original function” (p. 188). One of the most incredible pieces of the Giannelli Collection: Wrought iron Renaissance bit , pierced and engraved. There are only two other known similar specimens. The final essay by Pierre Desclos has the merit of describing the complexity of the Renaissance bridles from the technical point of view and of explaining the progressive simplification of the bits during the following three centuries. Particularly interesting is the section devoted to the three main parts of the bit (the mouthpiece, the shanks and the curb chain) and to the complex technical terminology used in the treatises of the period, to which is also devoted a very useful glossary. Finally, it should be pointed out that this work was made possible by the decisive contribution of the Fondazione Iniziative Zooprofilattiche e Zootecniche (Zooprophylactic and Zootechnical Initiatives Foundation) of Brescia, which has been funding scientific, experimental and cultural activities related to veterinary and biomedical sciences for sixty years. Since 1979, the Foundation has also been active in the field of scientific publishing. This book is number 100 of its series of monographs and it is a worthy climax of the Foundation’s meritorious commitment in the promotion of culture and scientific research. Unfortunately the book, which is available only in the Italian edition, is not distributed through normal commercial channels. Anyone interested in buying it, can request it by sending an email to this address: c.giannelli@alwicom.net. I would be interested in a copy if this book. The book is not for sale on this website. It is available only in the Italian edition and it is not distributed through normal commercial channels. Anyone interested in buying it, can request a copy by sending an email to this address: c.giannelli@alwicom.net. Thank you very much for you interest in my article. I hope you will keep on following my blog. Very, very interested in this book as bits are a fundamental part of my research into Roman cavalry. I would be most interested in discussing the development of the curb chain with you if that would be possible? May I contact you about this on the email you have given the previous comment, please? I’m very glad you liked my article. Unfortunately, at the moment the book is only available in Italian. Of course, you may contact the author of the book, Claudio Giannelli, by sending him an email at the above mentioned address. Thank you very much for your appreciation. I hope you will keep on following my blog. 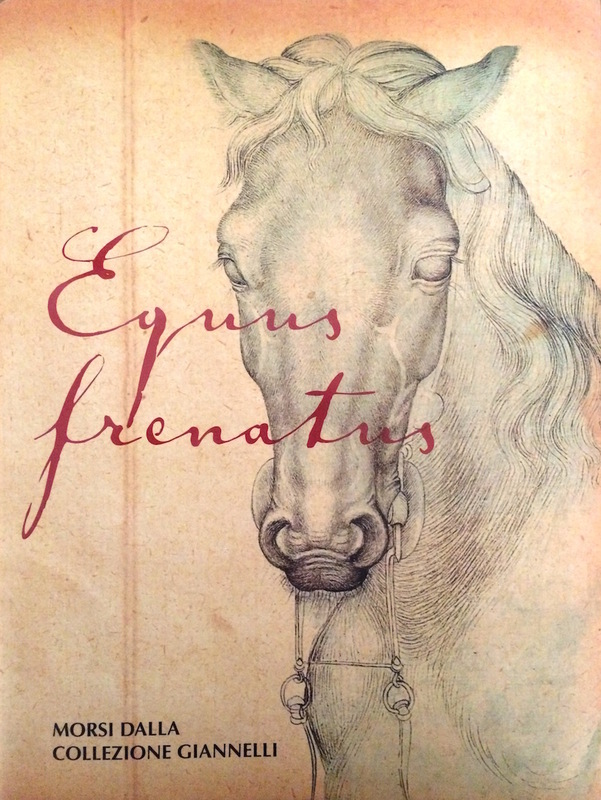 Desidero sapere il costo del volume “Equus frenatus”. il libro sulla collezione Giannelli è stato pubblicato dalla Fondazione Iniziative Zooprofilattiche e Zootecniche di Brescia e non è distribuito attraverso i normali canali commerciali. Può però richiederlo inviando un’email a questo indirizzo: c.giannelli@alwicom.net.